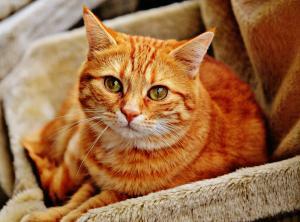 As with dogs, mild stomach upsets in cats are not uncommon. Typically a sudden change in diet, over-eating or an intolerance to a food not usually consumed can cause stomach upsets in cats. Starving for a period of time and giving a bland diet for 7 days before transitioning back onto their normal food is recommended. However cats should not be starved for longer than 24 hours and kittens ideally no longer than 4 hours. Unlike dogs, hairballs are also a common cause of digestive disturbance in cats. Hairballs are caused by cats grooming themselves and swallowing hairs from their coat which accumulate in the stomach. You can try to reduce the frequency of hairballs in your cat by grooming them regularly to remove loose hairs, give a specific hairball care cat food and even a laxative hairball product to help hairballs pass through the digestive tract. Again, there may be more serious causes of acute stomach upsets in cats such as an intestinal obstruction, ingesting a toxic substance, parasites, pancreatitis or a viral/bacterial infection. Cats that are vomiting and having diarrhoea excessively, are lethargic, appear to be in pain and have lost a lot of fluid should see a vet straight away. ReguTum Probiotic Paste is our probiotic paste for settling stomach upsets in cats. As well as being tasty, it contains ingredients formulated to help maintain a healthy balance of bacteria in the gut, improve the consistency of faeces and support the overall health of the digestive tract. Have this product close to hand for those unexpected moments when your cat is feeling uncomfortable and unwell.